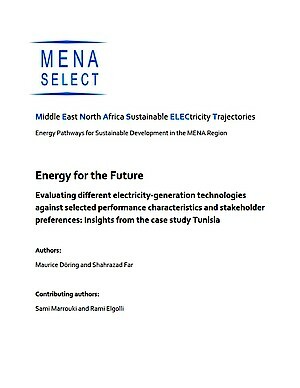 Energy for the Future – Evaluating different electricity-generation technologies against selected performance characteristics and stakeholder preferences: Insights from the case study Tunisia (MENA SELECT Working Paper). Tunisia faces the challenge of meeting its increasing energy demand while at the same time responding to urgent developmental challenges in the midst of socio-political transformations. Achieving societal support for its energy policies is vital to a successful energy transition to sustainability. In its latest study, the joint research project MENA SELECT (MENA Sustainable ELECtricity Trajectories) evaluates different electricity-generation technologies against selected performance characteristics and stakeholder preferences. The publication by Maurice Döring and Shahrazad Far, supported by Sami Marrouki and Rami Elgolli, is based on insights from the case study in Tunisia. In a series of workshops in which an innovative participatory and inclusive methodology was applied, the project elicits different interests and preferences of key societal stakeholder groups to identify respective needs and expectations towards Tunisia's energy transition. Selected electricity-generation technologies are evaluated against stakeholders' preferences and a set of environmental and socio-economic sustainability criteria. While different perceptions and priorities do exist, stakeholder groups show a strikingly strong agreement that the most vital objectives of Tunisia's energy transition are 1) less dependency on energy imports, 2) the safety of the people, 3) the creation of green jobs and 4) the fight against rampant pollution. As the analysis shows, photovoltaic and onshore wind have the potential to receive the highest societal support, while fossil fuels are not able to meet stakeholders' future priorities. The dominant majority of stakeholders see no future for nuclear power in Tunisia. The conclusion to be drawn from the multi-stakeholder dialogue is that substantial reform of the electricity sector, the empowerment of social interest groups to take part in national policy dialogue and allowing a greater stake of local communities in implementing energy projects are essential aspects to a pathway to sustainable energy that is approved by society.